The methods of milling lumber from logs creates very different types of boards. The way in which a dimensionally milled piece of lumber, like a decking board, is cut from the log determines its appearance and also its stability. In addtion to that, saw mills often like to save money and get the maximum useable lumber from a log. Certain types of cutting leave more or less wood waste. The various cuts of lumber are optimal for certain types of structural boards or members in a deck or house. Posts, decking boards, joists, stringers all can be cut from different parts of the log. 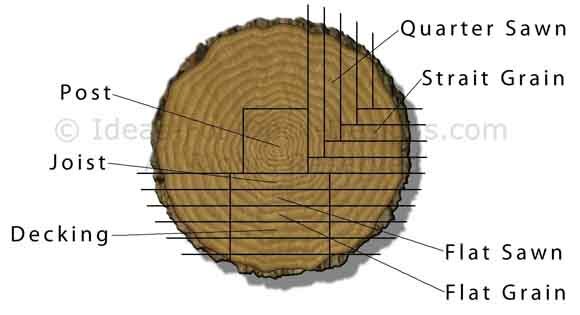 Posts are most efficiently milled from the center area of the log as shown. With smaller logs there is often no other choice than to cut the post from the very center of the log. However, with larger trees many more posts can be cut from the same log and so mills can divide up the log easier and cut using a variety of the techniques shown. Lumber that is used for joists or beams is usually cut flat grain. Not because it has to be this way to make the boards look nicer or be stronger, but simply because it is a more efficient way to cut up the log. There is a lot less waste and the log can be pulled back and simply moved through the blade for each cut. 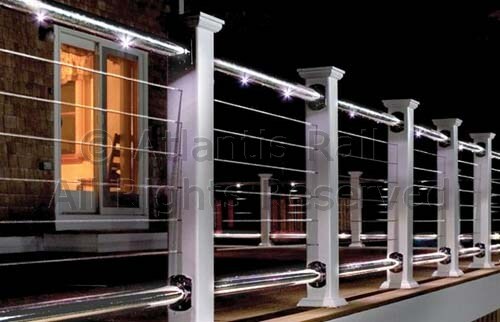 Boards that are used for decking are also most commonly flat sawn or flat grain. This is also just because of efficiency and to minimize waste. Boards that are flat sawn have one inherent weakness which is accentuated depending on the natural instability or stability as the case may be of the wood species. As the boards dry out, the amount of of shrinkage varies along a boards length, width and thickness. It shrinks very little along its length. Maybe 2% at most. It shrinks as much as 4-6% across grain lines . And it shrinks as much as 8% between grain line interfaces. All you need to know is that this difference in rates of shrinking can cause a board that is cut flat across its grain can cup. Why Use Quarter Sawn or Flat Sawn Lumber? Cutting an entire log in a quarter sawn pattern requires more labor and time. The log has to be reset by 90 degrees every pass or at least every second or third pass of the blade. This ensure that the cut is always perpendicular to the grain lines. This creates the characteristic straight grain line pattern. For wood species that are known for its grain straightness such as Douglas Fir or even Western Cedar, this is seen more often. It results in beautiful looking boards and also more stable as they dry out. But they are much more expensive. It is true that as you rummage around the lumber pile in the store you may find the odd quarter grain board. But that is not by design. It is just the result of cutting the log in a flat sawn manner and getting the odd quarter sawn piece. There is not much control you have over the milling style of boards. You've just seen the different ways of milling lumber from logs. Each way creates the grain effects you seen in the lumber you buy. To get specific cuts you usually have to go to a local saw mill and request it.